“She is the bringer of light in the darkness, yet moonlight both reveals and conceals. Her bright faery hoof prints light the path ahead of you, guiding you through the dark. She is also one of the guides at the passages between the otherworlds and this one. It is she who, with her bright light, tends the Gate of Revelation, showing us the way through by illumination, while her sister, Epona’s Wild Daughter helps guide us through the Gate of Despair. Laiste’s gate is much more fun. Yet, in the process of guiding us, Laiste may pull a veil of cloud across the face of her mother, the moon – and three steps later we fall into a bog. “That should wake you up,” she thinks, smiling wisely. She disapproves of sleep walking, which is something that most of us humans do a great deal of the time. The night contains too much magic and beauty and wisdom to walk through it unseeing. You may find her activities helpful, you may find them frustrating. How you take them is entirely up to you, but they are intended to help you awaken. Bear in mind that she does not trip us; she merely places an obstacle or a pitfall lin our path, and we, sleep walking and unaware, step right into it. We do not have to do that. As always, it is our choice. Lasite wants us to be open to the great unknown, to mystical (not necessarily magical) experience that teach us an expanded way to relate to the multiverse, all of the worlds and dimensions together. She is daughter of the moon, but she is also an illumined child of Unity. Where the Losgunna, the Frog Queen, wishes you to get in touch with your subconscious and find the treasures there, Laiste hopes that you will reach for your higher self, your not-yet-realized cosmic wisdom. You know far more than you know you know. There are places in ourselves that we may have feared because they are shadowed and unknown. We may imagine them full of monsters when, in fact, they are inhabited by joyful spirits. She wishes us to explore this terra incognita because that is where much of our potential and as yet unexplored wisdom lies. Laiste reaches into our deepest minds, opening long shut doors, illuminating and revealing the uncultivated ground of our being – our hidden senses and talents. She speaks to us in the language of symbols, as faeries often do, because words are so limited. Any one symbol may speak to us on many levels of consciousness and about many different aspects of being, if we spend time contemplating it. Laiste is a sphinx, and finding the answers to her profound riddles gives us keys to the multiverse. If you are attending to your dreams and visions and studying every day occurrences, trying to discover the deeper levels of meaning in the symbols there, you are learning the language of Laiste. That language is spoken by artists, like Brian, and poets, whose works are informed by rich symbolism. 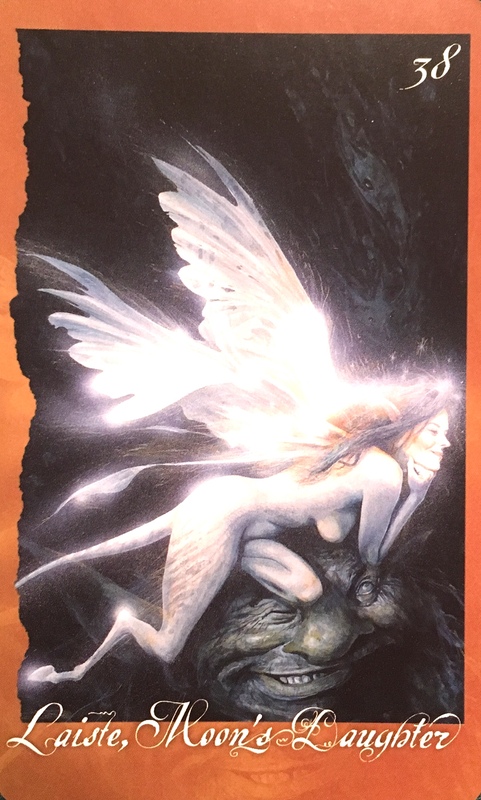 Discovering it through study, through looking within ourselves, and through interaction with faeries not only teaches us the language of Faery, of art, and of high poetry, but is also gives us keys to our own psychic abilities and to the deep levels of our own psyches, where the Singers and the creative force of Unity are most easily found. Through revelation and the ecstatic experience of the mystic, Lasite faces and leads us into the future. She prefers to let the old stuff of the past fade away in the illumination of insight and newly accessed wisdom. You may be finding apparently random events and ideas are falling into a pattern and beginning to make sense to you. Things may be flowing more easily than you are accustomed to, and your decisions and choices may be bringing an unusually high degree of success. Psychic abilities hunches, intuitions, foreknowings- are becoming clearer and making more sense. Trust the process. When the realm of Faery steps into the forefront of our lives, we are reminded to expect the unexpected! Faeries take their jobs seriously, but as they do so, they love to have a bit of fun while they are at it. They love to shake things up, and make us see things from a different angle; and they love to do it in a way that we simply cannot ignore! Obstacles or challenges may actually be doors to new opportunity as we are re-routed through interesting and amazing circumstances! The moon is full in Cancer and as the year comes to a close we may be feeling like we are riding an emotional roller coaster. There may be some final clearing that needs to be done, and if you have been refusing to release some old pain or trauma, it may come up to force you to do just that. Cancer is one of the most emotional signs and their waters run very deep. Instead of allowing the fear to come up, decide to meet it face on and find a way to let it go. Remember, you can only move forward when you let go of all that weighs you down. It is time to make the space for something new. It would be ideal to spend a little time in quiet contemplation today, even just a few minutes to catch your breath. There may be someone who you need to avoid until the full moon energies stabilize and integrate as you do not want to get sucked into their drama and toxicity. Give yourself permission to say no, to take a break or a breather, to not answer the phone call or the email today. Give yourself permission to allow more magic into your life. If possible get outside and leave a little gift under the full moon for the Faery realm; a little crystal or trinket, a colourful feather or treat. Accept their guidance and assistance, allowing them to lead us into a more expanded version of ourselves. And of course, if we are dealing with Faery energy, you are probably going to want to buckle up!